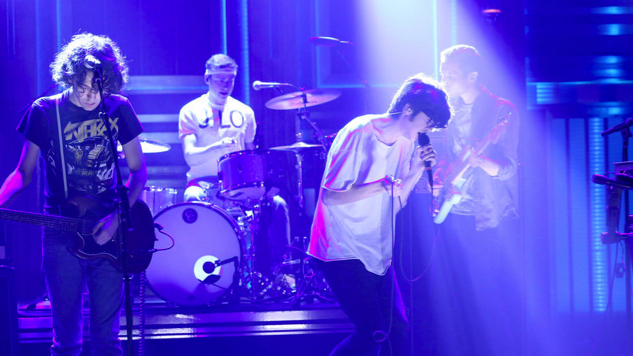 Last night, Car Seat Headrest performed “Bodys” from their revamped version of Twin Fantasy, out now via Matador Records, on The Tonight Show Starring Jimmy Fallon. Toledo will be touring in support of his reimagined album, recently adding fall shows to his band’s already-extensive schedule. Previously announced dates take the band through Europe and the U.K., with summer stops on the U.S. West Coast. The now-confirmed fall leg of the band’s North American tour kicks off Sept. 5 in Minneapolis and extends to a Sept. 27 stop in St. Louis. The band will play in cities throughout the U.S. and Canada, including two back-to-back shows at New York’s Brooklyn Steel. Paste’s Ben Salmon wrote of Car Seat Headrest’s Twin Fantasy, “Sonically speaking, Twin Fantasy ‘18 sounds more or less like an HD upgrade over the bunny ears of Twin Fantasy ‘11.” Read Paste’s full review of the album here. Watch the band’s performance of “Bodys” below and check out their upcoming tour dates further down.